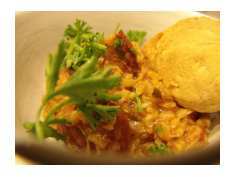 This jambalaya recipe is Creole and traditional. I smoke the chicken myself, and the end results were fantastic. Creole jambalaya originates from New Orleans and has tomato in it. There is also a Cajun Jambalaya that originated from the swampy, rural areas of Louisiana. It features meats like duck, alligator, craw fish and shrimp, and does not have tomato as part of the dish. The video is over ten minutes long, but I really cover everything. If you want to make traditional Creole Jambalaya, it's definitely worth the view. First of all, a few tips. Use a thick cast iron dutch oven if possible. Creates a radiant heat that circulates throughout the dish while its cooking. Use only chicken thighs. 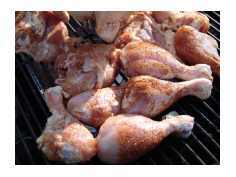 I use legs as well in this recipe, but next time I will use thighs only. Prepare and chop all of your ingredients prior to cooking. Once things start, it all happens quickly. If possible, consider smoking the chicken. Adds a lot of depth. If you use brown rice versus white rice, plan on an extra hour of cooking time. Wash your hands after chopping the jalapeño. The video will explain. Be patient. This dish is a labor of love. Involve your kids or grandkids. This is a great traditional dish to pass down to younger generations. 3 1/2 lbs of Smoked Chicken Thighs: Remove the skin before you smoke them. 2 Jalapeño Peppers: Seeds removed and chopped. Wash your hands after this! 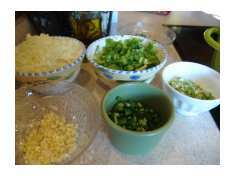 1 Bunch of Green Onions: Separate the white portion from the green portion. Chop both and keep separated. 4 Chopped Tomatoes: Canned is fine. 3 Cups of White or Brown Rice: The brown rice will add another hour to cooking time. Leave Jambalaya Recipe and Return to BBQMyWay Homepage.